It has taken over 18 month to build, punctuated by physical injury (my back is not the strongest) and, of course, the seasons. But it is now full of water. 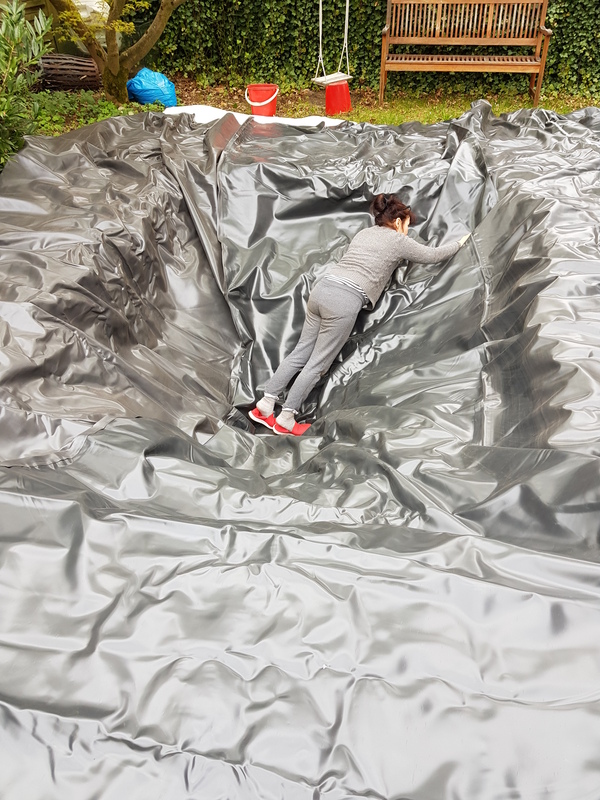 It measures 2.5m x 4.5m and at its deepest, 1.4m. That is a lot of digging. That is a lot of stuff from a hole, mostly gravel and stones. When one looks at the tutorial videos on Youtube, they are always very geometric, dug into rigid soils (clays) and not as deep. The process of lining seemed very simple. In our case, not so easy. 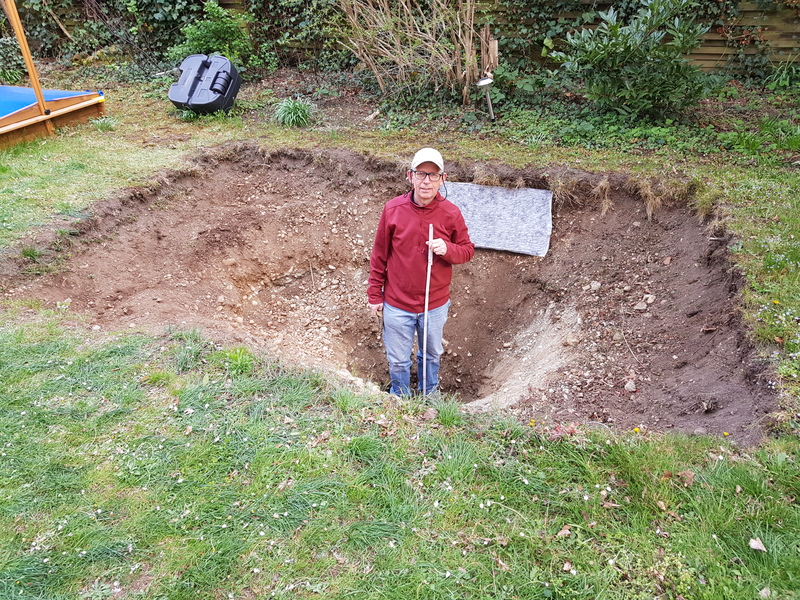 The gravel is not so stable and in the digging – easily collapsing in the hole that had been dug. The topsoil in the west of Munich is not very deep, around 10-20cms only. OK, so then wet sand is used to deal with the gravel and stones. That is quite a task, rather like plastering a wall (right). Fortunately, the temperature was about 8 degrees Celsius and there was little wind. This meant that it did not dry out too much and blow away. Overall a good couple of hours devoted to that task. 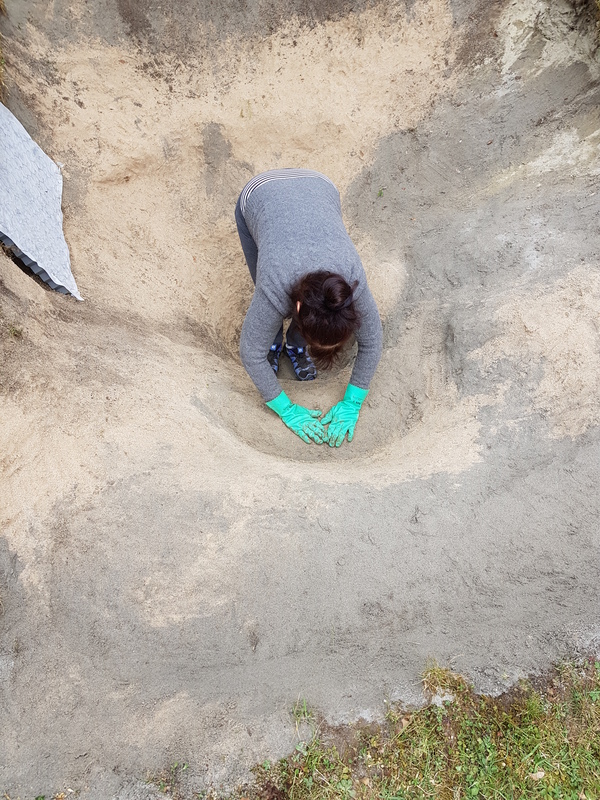 We did not have enough sand (125kg), so we raided the grandson’s sandpit to finish the job. Hence the contrasting colours. 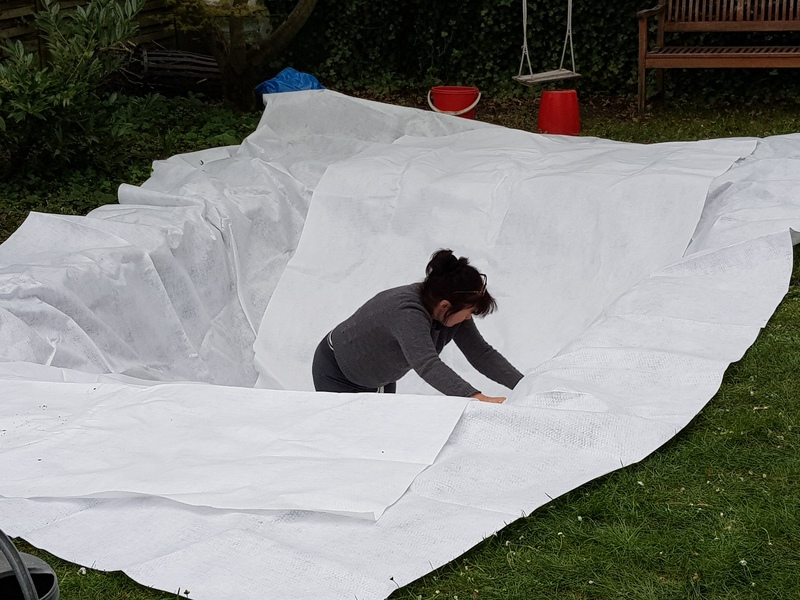 We bought the lining and underlay last summer – a little too optimistically. But they were there to extract from the garage when ready. The underlay came in three strips. It is made of a very light textile; it looks like blotting paper, but was surprisingly strong. It gave some shape to the hole that I had dug. Stepped on one side (where the most rigid soil was) and sheer on the remaining three. And then the big one, the lining. This is a very heavy PVC and, naturally, comes in a single piece. 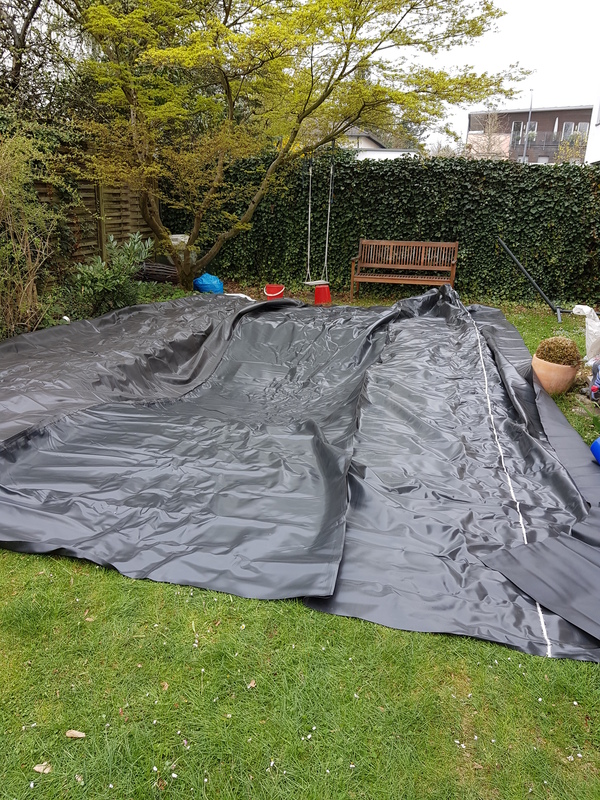 We first had to unfurl it and essentially drag it over the hole like one of those enormous sheets they use in swimming pools to keep in the heat overnight (right). And then we had to entice it down into the hole. It was robust enough to take our weight, though we changed our shoes into something more slipper like, just in case. It took about an hour to fold the lining in the right places. We created pleats around corners. We gave it a lot of slack (below left). And then the moment of truth. A pond is still only a hole until it has water. 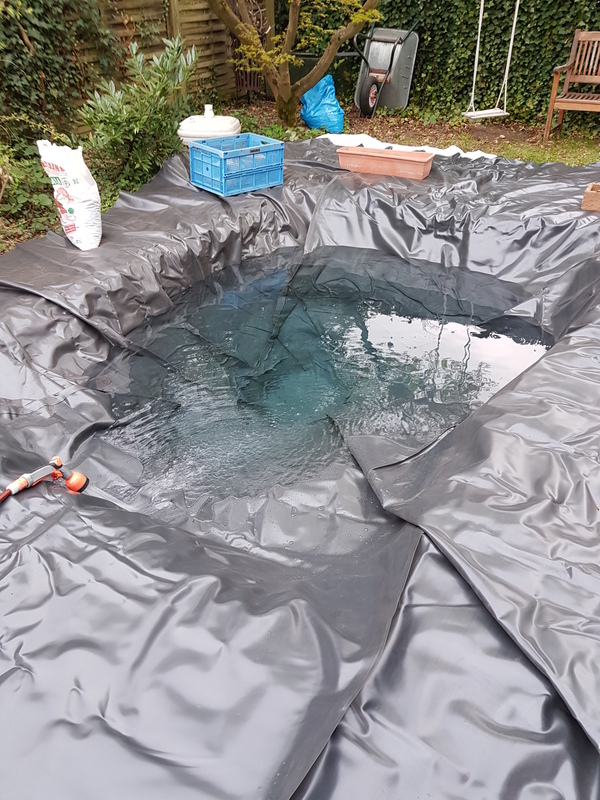 We have calculated it holds about 9000 litres. We trust that is enough weight to hold the whole thing together. We attached the hose to the tap and then turned it on. Slowly it filled. Obviously now this is just a hole with some water in it. We need plants, additional rocks around the edge and for nature really to contribute. We know there are frogs and newts in the vicinity. We also know the local birds are excited about having a large water source. Though we need to make some perches for them as it would be easy to fall in and drown. We are also going to get some native fish. They are primarily the reason for the depth. Winters can be punishing and water readily freezes. Though I challenge nature to freeze water to 1.4m!